That Mangusta can accommodate 8-9 guests in 4 cabins. The Owners-Cabin features a king size bed and ensuite bathroom, there are 2 double cabins with ensuite bathroom and 1 twin cabin with additional Pullman berth and ensuite bathroom. Exterior dining with elevating Teppanyaki grill..
She also carries an impressive collection of toys as listed below. Finally, engines had there 10 year maintenance!!! 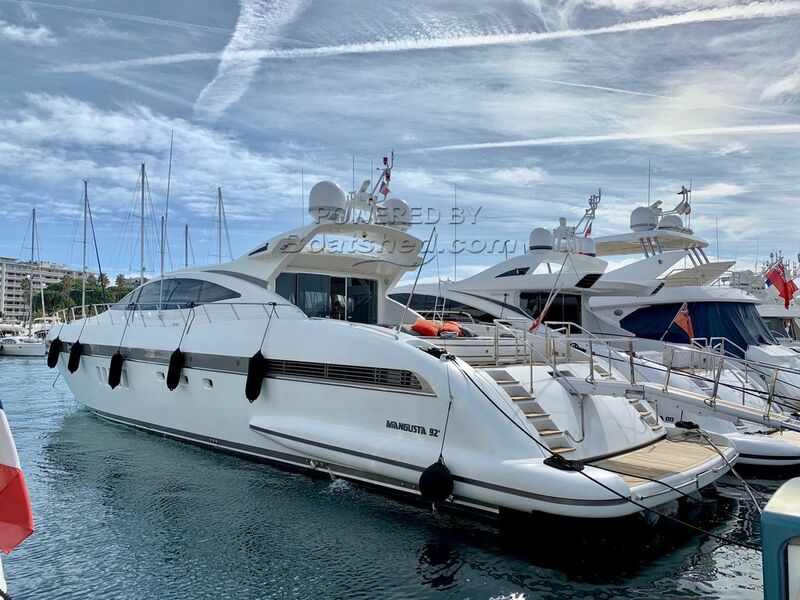 This Mangusta 92 4 Cabins Version has been personally photographed and viewed by Antoine Perrin Daragon of Boatshed Riviera. Click here for contact details. Please note this comments section is public. Please do not post your personal details here. To enquire about purchasing this boat, please contact the broker directly at antoinedaragon@boatshedriviera.com. Please read our commenting guidelines before posting.